National History Day Rhode Island is an affiliate of National History Day, a highly regarded curriculum enhancement program for students in grades 6-12. 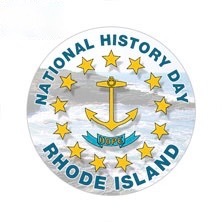 Rhode Island has participated in National History Day for 35 years with our first national competition in June of 1983. The 2019 state contest is being hosted by Rhode Island College on Saturday, March 23rd. RI students from public, private and parochial schools from Newport to Woonsocket will be participating in this exciting academic competition. Each year, more than half a million students, encouraged by thousands of teachers nationwide participate in the NHD contest. Students choose historical topics related to a theme and conduct extensive primary and secondary research through libraries, archives, museums, oral history interviews and historic sites. Check out this video to hear from students about how participating in National History Day helped prepare them for college and learn valuable lessons for success. Registration will open on February 4th and will close on March 1st, 2019. There is no fee to register and attend the state contest this year. We are thrilled that you are participating NHD Rhode Island 2019 competition! NHD is an excellent opportunity for you to develop your research skills, meet other driven students, and entertain your passion for history. This page will be a quick reference of important information relevant to students with links to find more details. We are thrilled that you are interested in having your students participate in National History Day Rhode Island! NHD is a wonderful opportunity for your students to develop a project on any aspect of history around any locale on the planet which connects to the theme of "Triumph & Tragedy," and to compete with other students in their age division across the state. Teachers must register before their students. Once you have completed your registration, please have your students register.
" A true teacher is one who, keeping the past alive, is also able to understand the present." Judges are crucial to the success of National History Day, not only through deploying their expertise in evaluating the students' projects, but more importantly by the provision of supportive feedback, which helps students improve their overall history skills and (hopefully) their entries. As a judge, you will be assigned a specific category as well as a division (age group) and will evaluate only the entries within that grouping. You will be able to select your preferences of categories that you would like to judge during the online registration process and will be placed (as best we can) within one of your top choices. Judging teams will be grouped by these placements, then further constructed based on expertise and area of focus to provide a comprehensive and well-rounded team composition. This year's theme is Triumph & Tragedy in History. Each entry must relate to that theme and students produce their work in the form of historical papers, exhibits, documentaries, websites, and performances. The contest levels are grades 6-8 and grades 9-12. A separate panel will judge each category and each entry competes against others at the same level. Judges in the historical papers and website categories read papers and view websites beforehand; others need only to become familiar with the rules before the contest date.